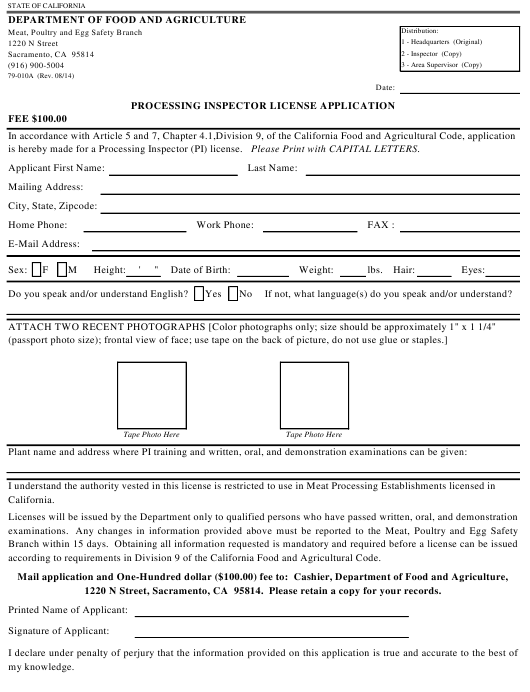 Form 79-010A or the "Processing Inspector License Application" is a form issued by the California Department of Food & Agriculture. The form was last revised in August 1, 2014 and is available for digital filing. Download an up-to-date Form 79-010A in PDF-format down below or look it up on the California Department of Food & Agriculture Forms website. is hereby made for a Processing Inspector (PI) license. Please Print with CAPITAL LETTERS. Do you speak and/or understand English? If not, what language(s) do you speak and/or understand? ATTACH TWO RECENT PHOTOGRAPHS [Color photographs only; size should be approximately 1" x 1 1/4"
according to requirements in Division 9 of the California Food and Agricultural Code. 1220 N Street, Sacramento, CA 95814. Please retain a copy for your records.